One special structural feature of Chanticleer is its ruins. Yes, ruins! Not actual ruins, but a stone mansion, roofless and apparently falling apart — all built to look that way. Why? Because ruins add a romantic air to a garden. Dilapidation. Plants re-enveloping the decrepitude, much like the lush trees ready to gobble up oblivious humans frolicking in Fragonard’s Roccoco landscapes. A return to the primitive, to Eden, Nature regaining the upper hand. Chanticleer’s ruins may look like Nature is gaining control but it’s not so. After all, this ruin was built. The plants, likewise, are planted. So dripping out from crannies among the rocks are chains of succulent plants. Water gathers in nooks (constructed, of course) in which grow water plants. In one “room” that could have been a main hall in this ruined mansion, if it had ever began life as a non-ruined mansion, is a large, stone table with a mirrored surface. The edges of the table actually form a lip which hold the pool of water that makes the table’s mirrored tabletop. of grasses. Lawn sculpture, of lawn. So there is mown lawn within which are splayed large sections of tufted, tawny, clumping grasses (fescues, I believe). Cover crops, which are used on farms for soil improvement, are used decoratively at Chanticleer, perhaps also for soil improvement. 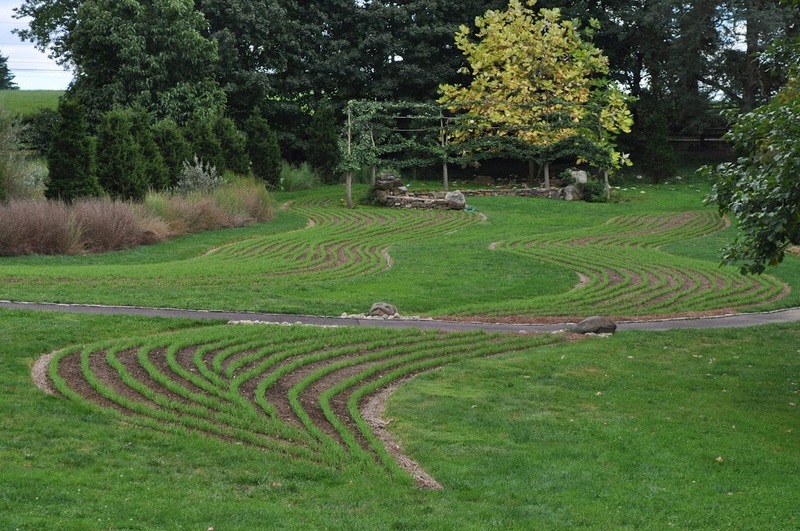 One 70-foot-long by 15-foot-wide, leaf-shaped bed had been tilled and was sprouting “veins” of rye(?) plants along its length. leaves. 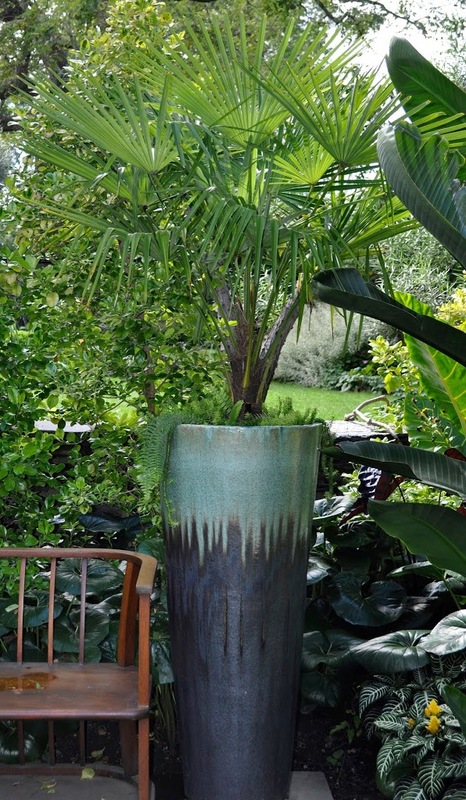 Some grow in pots, attractive and distinctive in their own right. In response to my query about how they store all those tender plants in winter, I was told that most were discarded. Chanticleer closes for the season November 3rd. Oh, and they do have pretty flowers also at Chanticleer. Returning to my own garden, has Chanticleer now provided inspiration for here? No. My garden is a very different kind of garden from Chanticleer. Chanticleer provides a thoroughly enjoyable feast for the eyes, but not something I need to take home. The main emphasis here on the farmden (see, it’s not even a garden any more) is edibles, albeit used more or less decoratively, depending on where you look. A feast mostly for the mouth, somewhat for the eyes. The goal is to produce an abundance of flavorful, nutritious foods pretty much the year ‘round. Year ‘round food is made possible in this climate — here at the farmden, at least — with freezing (many vegetables), common storage (e.g. cabbage, apple, pear, onion, squash), fermentation (cabbage, radishes), drying (tomatoes), one 5’ by 5’ coldframe (lettuce and other salad greens), and a 400 square foot, minimally heated greenhouse (lettuce and other salad greens, kale, chard). and Seuri-Li Asian pears hang from the branches of espaliered trees sitting atop a stone retaining wall. Atop another retaining wall along the east and north side of the house is a lush, green groundcover of lowbush blueberries, soon to turn a fiery crimson color. Mingling with those blueberries are low-growing lingonberries, whose red fruits are highlighted by the backdrop of the plants’ glossy, evergreen leaves. 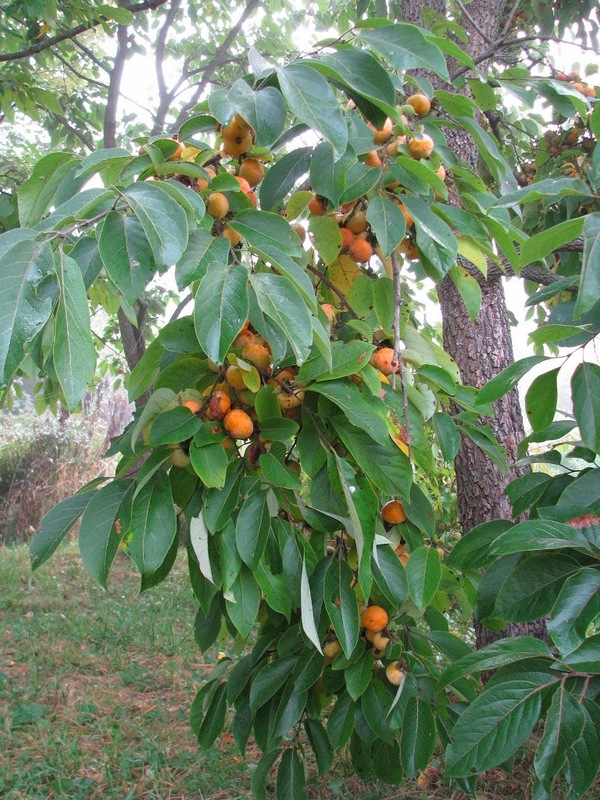 Way in back, running down the field is a row of pawpaw trees, their large, lush tropical-looking leaves hiding the mango sized fruits now ripening. The creamy white fruits have taste and texture along the lines of vanilla custard or crème brulée. Some of the leaves have begun to shed their tropical look as they turn a clear yellow. remain edible even after the leaves drop. The fruits, the varieties Mohler, Dooley, and Yates, are delicious, akin to dried apricots that have been plumped up with water, dipped in honey, then given a dash of spice. And on and on. Very tasty. And nice to look at. But Chanticleer is admittedly nicer to look at. 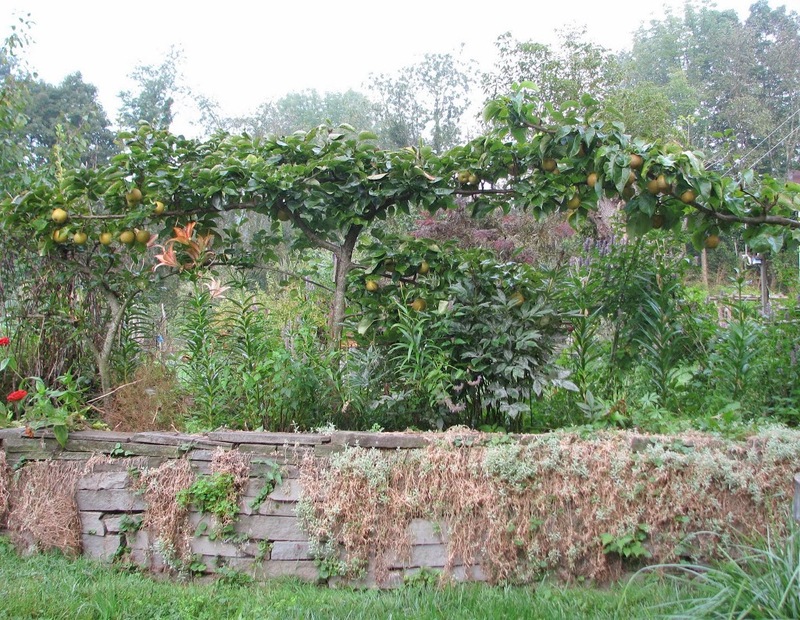 This entry was posted in Uncategorized and tagged Asian pear, Chanticleer, cover crop, pawpaw, persimmon. Bookmark the permalink. Trackbacks are closed, but you can post a comment. « A Scything I Do Go . . .